Almost an outfit. Most definitely a Sewalong. What went wrong with this outfit? So. Most everything that could go wrong, went wrong with this shirt. But – I have not given up. I will learn from my mistakes, and make another version, because I love the idea of this shirt. You see, this shirt has been in my mind for years. The most observant amongst you might recognize the pattern from Zoe´s recent wardrobe clear out. Her Ship Shape blouse has been on my to-do list since I first saw it, and I even tracked down the particular Burda Magazine just for that pattern (BurdaStyle 01-2008 for those who are interested). Fabric choice. This shirting is just too low quality to actually use for shirts. I bought it on sale to use for a muslin for Anders´shirts. I thought maybe I could reuse it for myself. Not a good idea. It´s completely see-through and not in any way something I would like to wear much. Poorly executed FBA. I just took a chance. I added a couple of centimeters here and there. That can work for knits. Not at all so for wovens. Lesson learned. Shirt style. Although I still love the bib, I am not too hot on the rest of the pattern. I´d rather have princess seams. It´s much easier to tweak. The collar issues. 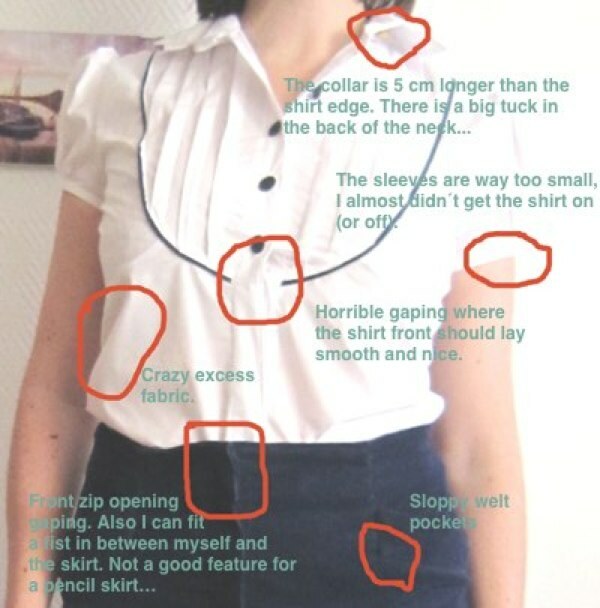 Because I didn´t take the collar into consideration when I did my sloppy FBA. The skirt, poor thing, is just a result of my own miscalculations. 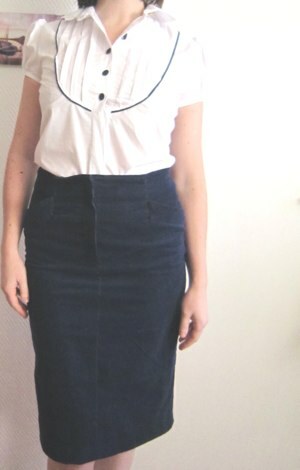 I had this nice navy corduroy and thought I´d put it into good use by making a skirt . Really. As if I really needed another navy blue skirt;-). Anyhoo. I made it using a BurdaStyle pattern from the March issue of 2010, mostly because I had that skirt pattern already traced and ready to go. What I had forgotten was that I´m not particularly fond of a front fly. I am more of a side/back- zip kind of a gal, so when I finished the skirt, it looked unbelievably frumpy. That is a lot of fabric. But I really hope to work through most of it! Washable make-up pads. One side is quilting cotton. Other side is minky. I use these all the time, and found it was time for a new batch. You can´t have too many! I got the idea for them back in 2009/2010 here. 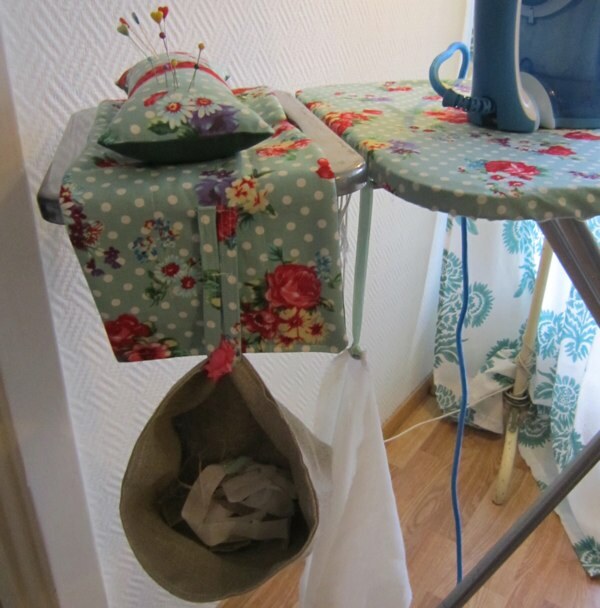 A much needed scrap bin and new ironing board cover. I used a tutorial for the scrap bin and caddy that was on the very helpful Stashbusting Sewalong HQ Pinterest board for January. Another pic of the caddy and the brand new pincushion. There are handy pockets in the caddy , and the little red fabric in the pin cushion is felt – a desigated area for my needles! 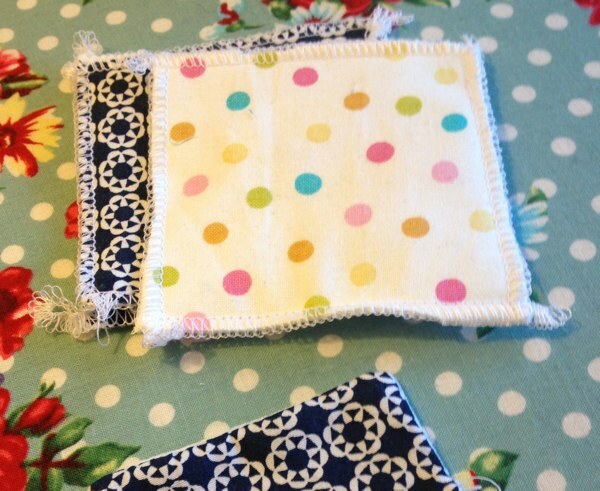 The pincushion is filled with rice, to make it less flimsy, and it holds everything in place. I also got a brand new iron this weekend, and I love it! It has an eco-mode, it gives out less steam than others without lacking in efficiency , and it´s partly made of recycled materials. Thank you Phillips! All in all I am pretty pleased with last weekend´s sewing efforts. 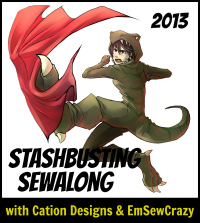 Are you joining in the Stashbusting Sewalong? I don’t think it looks as bad as you think it does!! I *love* your selfish sewing plan though. I need to get on that. I’m still mentally preparing for the stash-busting project. I can also see the positives in your almost outfit! I hope you can save them as they really do have potential, and I love the bib blouse. As for your stash busting productivity, wow! I think I feel more organised just looking at the system you’ve created for your ironing station. 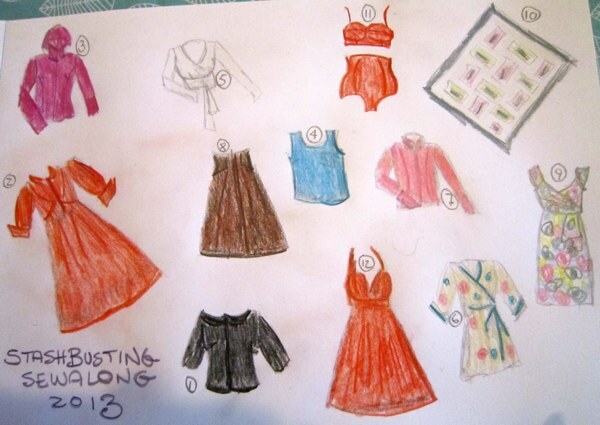 Ps I love seeing your sewing sketches too ! I definitely will save the skirt, no doubt. Look out for it sneaking into feature posts! 🙂 And I have to say I am so pleased with the way I organizde things around the ironing board. For the first time it doesn´t become a complete mess the minute I lay eyes on the iron anymore. Woohoo! 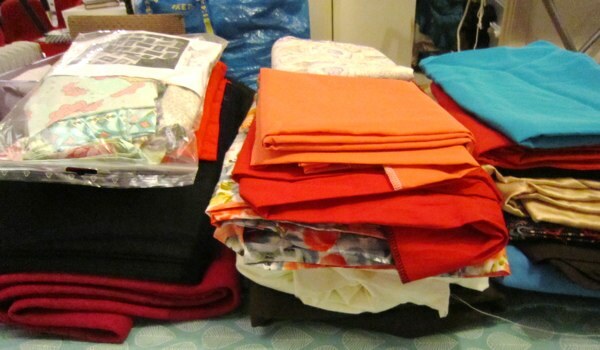 I’ve made most of my to-sew list from my stash this year. Fingers crossed I’ll stick to it. I hate fly-front skirts too! I have quite a little potbelly, being an apple shape, that makes it always stick out funny. Alas. Apart from the clothes, the other stuff you made came out awesome, I lurve the fabric you used on your ironing board decor. I don’t think your outfit looks bad at all! Honestly, I think most of the time we just overthink things because we see through sewists’ eyes. At any rate, your scrapbusting looks amazing…I love your illustrated plan! Awesome that you’re joining the stashbusting challenge! Your new projects look great and very useful. And, thanks for the sweet words about my blog! I’m glad you’re joining in the challenge! And your new projects look awesome and very useful. Also, thank you for the sweet words about my blog! 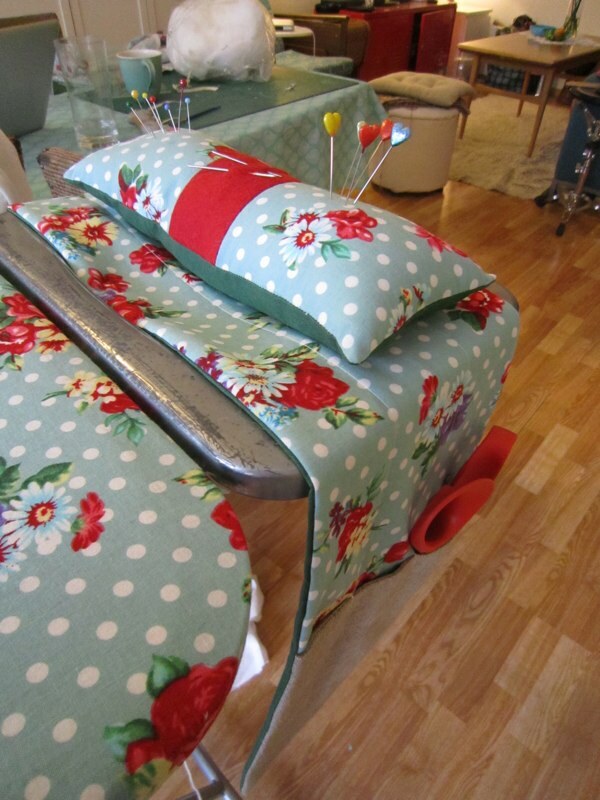 That caddy and pincushion looks so lovely and useful! Great idea! Sorry to see the outfit didn’t work out but your plans for sewing this year look intriguing, is that underwear or a bikini at no. 11? Love the idea for reuseable make-up pads, definitely going to have to whip myself up some of those once the house is back on track! This post is so inspiring!! I absolutely love these stashbusting projects. 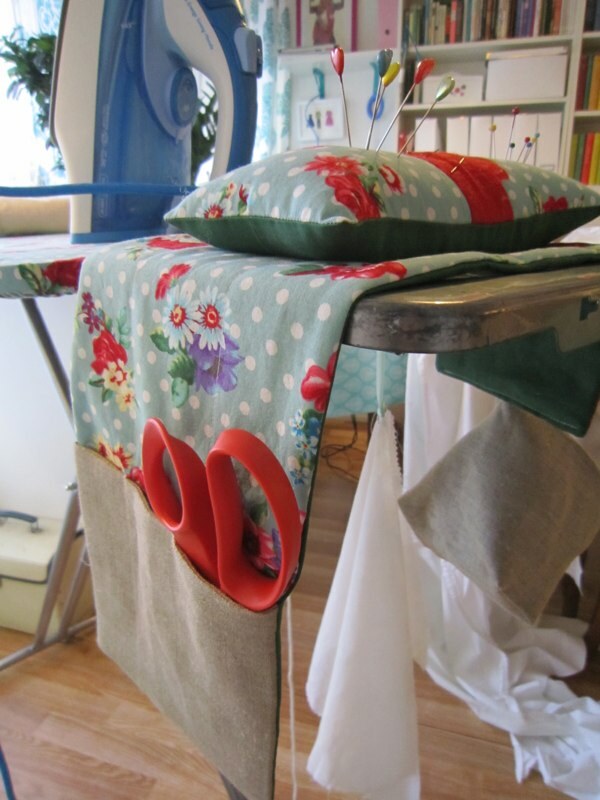 The fabric you used for the ironing board cover, caddy, etc., is beautiful. I’m also jealous of your sketching skills. Looks like you’re going to have an amazing 2013. The new blouse is lovely, by the way. I’m sorry you’re not happy with it, but it is a nice style on you so I’m sure you’ll work it out! Happy Sewing!! !